As I alluded to yesterday, there’s an analogue of L-systems for things more complicated than curves. In fact, there are a variety of them. 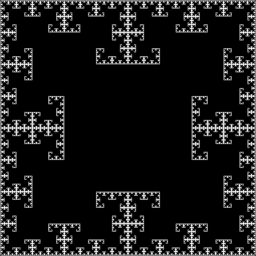 I’m going to show you one simple example, called a geometric L-system, which is useful for generating a certain kind of iterated function fractal; other variants work in a similar way. each iteration, for each of the outermost squares, you create a square one-half it’s size, and lay a copy of that on each exposed corner of the outermost square, so that the new square overlaps with a square 1/2 its size. That sounds confusing, but it’s pretty simple when you see it visually. Here’s a copy of the T-square after 4 iterations. You can see what I mean about how much easier it is to see visually. The T-square looks much more interesting after a lot of iterations – at the top of this post, there’s a copy of it from wikipedia after a bunch of iterations. It’s an interesting figure in its own right: it’s quite obviously got a finite area inside of it; but its boundary is infinite. A lot of people actually have a hard time grasping that: the idea of a adding constantly decreasing segments to a finite boundary doesn’t seem like it should be infinite. It doesn’t make good intuitive sense. But it’s pretty easy to show. we’ll expand the 4 outermost boxes by adding three new ones. So the boundary contributed by each outer square will be 7/4X. And the next iteration will increase the perimiter of those outermost perimeters by the same proportion. 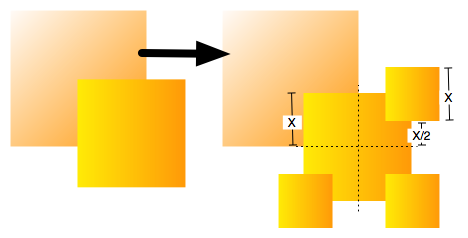 The length added to the boundary isn’t decreasing with each iteration after the first: the length added by each new box is cut in reduced; but the number of boxes added more than compensates for the reduction. But let’s get back to the geometric L-system. The idea is quite simple; instead of using an L-system over symbols and strings, we’re going to do something like an L-system over shapes and patterns. So the initiator is a geometric figure; the left-hand side of a rule is a pattern that matches a part of a shape, and the right hand side shows how to replace the part of the shape that matches the pattern. 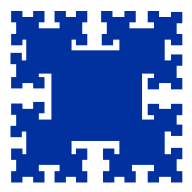 The pattern can be freely rotated to find a match. Here’s the one rule from the geometric L-system for the T-square. This entry was posted in Topology on August 1, 2007 by markcc. Terry Sejnowski is using L-systems in genetic algorithms to look at neuron structures and functions — video here. It doesn’t seem like it would be that difficult to come up with a traditional L-system to describe the boundary of this geometric L-system. The first square is composed of S Straights and C Corners. Replace each S with SSS and each C with C’CSCSCC’ (C’ is -90 degrees). Neat talk. I found the paper which they published this year on that material; sundry links and thoughts here. it’s quite obviously got a finite area inside of it; but its boundary is infinite. Oh god, it’s Gabriel’s Trumpet all over again! You *can* come up with an L-system formalism for anything that you can do with any of the variants of geometric L-systems; that’s why we call them a kind of L-system. The advantage of the geometric L-system isn’t that it can do fundamentally different things than an L-system, but that it’s *easier* to create and understand the L-system presented in geometric form. That’s the point of the geometric L-system: instead of shoehorning geometry into symbols, keep it as geometry. The advantage of the geometric L-system isn’t that it can do fundamentally different things than an L-system, but that it’s *easier* to create and understand the L-system presented in geometric form. Would I be correct though in guessing that the symbolic L-system will always be easier to *compute*? This sounds a lot like improper integrals. What a horrible name for such a neat concept really.